1 What is a pea (Pissum sativum) ? What is a pea (Pissum sativum) ? A pea (Pisum sativum) is a plant of the Papilionaceae family, in which there are some well known trees as the carob tree (Ceratonia siliqua) or the tree of love (Cercis siliquastrum), shrubs such as the crown vetch (Coronilla varia), or herbs such as clover (Trifolium sp.). Beans (Vicia faba) are another kind of papilionaceous plant used in feeding because of the nutritional value of their seeds enclosed in pods. A pea plant is an annual climbing vine up to 2 m high. Stems slender, wingless. Compound leaves with leaflets in pairs 1 and 3 each, stalked, surrounded at its base by large bracts embracing the stem, and far exceeding the size to the leaflets. Leaves and stems ending in tendrils: branched, single or double that the plant uses to cling to climb to any place that allows to maintain its weight. Flowers in racemose inflorescences at the end of the flower stalks, shorter than the leaves, which arise from the base of the bracts. The flowers are pink or purple with white or dark purple wings. Its fruits are green pods up to 10 cm long. Inside them there are some seeds (peas) in number from 4 to 10. They can be smooth or rough, depending on the variety. 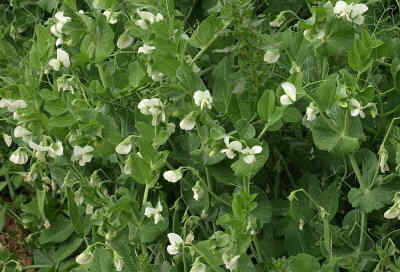 Cultivated since antiquity, peas often appear as wild herbs in fields or weeds. It appears that the pea in the wild has its origin in the East about 10,000 years ago. The first cultivation of this plant is placed in the same area on the seventh or eighth millennium BC. From this place, it was spreading to Europe and Asia. In the second millennium B.C., There are historical references to its cultivation in Europe and India. – Pisum sativum subsp. sativum: With white or pink flowers borne on short stalks. It’s grown more often. Its seeds can be smooth or rough. – Pisum sativum subsp. elatius: With flower stalks and flowers with longer wings, dark purple and purple standard. It is grown less than the previous species and feral specimens appear more frequently. – Pisum sativum L. cv. axiphium, commonly called snow peas, it is characterized by a very tender pod that allows to be eaten as a vegetable. – Dwarf varieties: Those that do not exceed 45 cm in height and need no tutor for support. Within this category, there are known varieties such as Aura or Negret. – Climbing varieties (branching varieties): Those that can reach two meters in height. They need a tutor to handle in order to climb. Within them there are same species that are considered high and other that are considered small. We also have middle varieties, such as Asterix or Lincoln. – Early varieties: Those that are planted in October to produce fruits throughout the winter because they can withstand cold temperatures. Early well-known varieties are Frimas or Froger. – Varieties of smooth fruit, such as the variety known as a volunteer. – Rough-fruited varieties, such as the variety called television. – Light green, being used for canned peas. – Dark green, intended to be eaten fresh or frozen directly. Peas were traditionally used for human consumption, but they were also used as feed for livestock, both as a tender plant or because of the dry seeds. In the sixteenth century, people began to use this plant as food for man. However, we must admit that most of peas produced in the world today are for the manufacture of animal food and only a small proportion is destined for human consumption. Currently there are peas in almost all parts of the world. The largest producer of peas in the world is India followed, with a much smaller production, by China and the United States. In Europe, the major countries are France, the United Kingdom, Hungary and Belgium. In South America we have Peru as the first producer followed by Mexico and Chile. Egypt is the largest producer in Africa followed by Morocco, Algeria and Turkey. Other countries with a high production of green peas are Australia, Germany, Canada or New Zealand.